Home Sports Five Uses, One Appliance. West Bend’s New Versatility Cooker! Five Uses, One Appliance. West Bend’s New Versatility Cooker! FORT LAUDERDALE, Fla.–(BUSINESS WIRE)–Since 1911, West Bend has been celebrating the flavors of fall and creating new family traditions with home cooked meals! Meals that are easy-to-prepare (thanks to useful appliances) and enjoy no matter how hectic a schedule. 107 years later, the times may have changed but the focus remains the same. West Bend’s new Versatility Cooker is a must have, multi-function appliance. Slow cook; use in the oven; cook on the stove-top; remove the pot and use the heating base as a griddle; remove the cooking pot for serving or store in the refrigerator; take it with you using the included travel tote; and when all is done, place it in the dishwasher for ease-of-cleaning. Recipes are included. This appliance truly earns its name as a versatile cooker. The non-stick, large capacity steel cooking pots range in size from 5 quart to 6 quart and come with stainless steel handles. With five temperature settings and a programmable timer, the West Bend Versatility Cooker will quickly become a family favorite. It’s ideal for busy home cooks who want dinner waiting when they get home; for sharing homemade meals at sports, family and holiday gatherings; and ideal for the busy and discerning home chef who wants to save time on cleanup by using one versatile, multi-functional cooker. 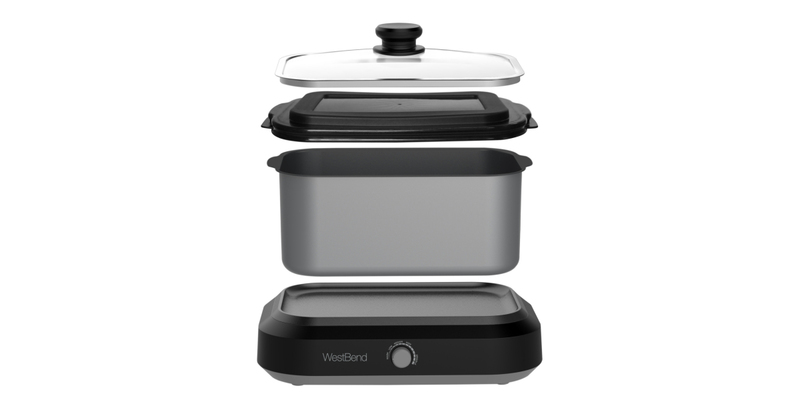 The West Bend 6-Quart Versatility Cooker #87906 is available online, in stores and at westbend.com for $69.99. For additional information, recipes and to see our complete line of versatility cookers, and other West Bend product offerings, visit westbend.com. West Bend®, a leading developer of electric kitchen appliances, has been in business since 1911. Spanning multiple generations with innovative product offerings, West Bend® delivers unmatched performance, quality, and value to consumers nationwide. Whether you're making fresh, homemade bread, blending smoothies, roasting a chicken, or baking a pizza, West Bend® strives to make your kitchen activities easier. Founded in West Bend, Wisconsin, West Bend celebrated its 100th anniversary in 2011. West Bend's headquarters is still located in West Bend, Wisconsin. It is currently a privately held company managed by The Legacy Companies. Editor’s Note: For images, sample consideration or more information, contact Meagan Bradley at 954.202.7419 or at [email protected].